Live Mortgage Leads and Telemarketing Live Transfer Mortgage Loan Leads including Real Time Leads and Hot Transfer Mortgage Leads. Looking for Live Transfer Mortgage Leads? Database Systems Corp. provides the technology and products that can improve the productivity of your mortgage loan processing department. Our mortgage predictive dialer and phone system with mortgage telemarketing software can streamline your operation while providing controls and consistency in your loan application process. But this technology can only help your mortgage marketing program if your live mortgage leads are qualified prospective clients. The following is a list of organizations that according to their website descriptions provide live mortgage leads. Database Systems Corp. is not affiliated with any of these organizations nor does it promote or endorse the products and services of these companies. This is simply a list of websites of available mortgage lead companies. These websites promote various types of leads including Real Time Mortgage Leads, Mortgage Marketing Leads, Refinance Leads, Home Equity Loan Leads, Second Mortgage Leads, Sub Prime Leads, Refinance Leads, VA Leads, FHA Refinance, Purchase, Excellent Good Fair Poor Credit Leads, Mortgage Brokers, Mortgage Lists, etc. 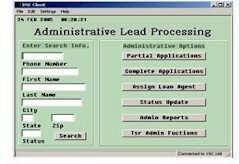 Does your organization provide any of the following types of Mortage Leads? If so and you would like your website included in this directory, please use our Submit Mortgage Leads Website form. It's FREE and simple to add your website. Our mortgage leads are fresh and of the highest quality out there. We generate our mortgage leads from our high traffic websites. Our mortgage leads are generated using various online advertising such as banner advertisings, pop-up ads, and through our affiliates. Our live leads are generated from our outbound call center and are probably the most fun to work with. Imagine being at the office and getting a call from one of our agents to let you know that we have a potential borrower interested in refinancing. Loan officers love those mortgage leads as they do not have to call the borrowers and chase them like you may have to do if you get an Internet lead or regular telemarketing lead. How many times did you have to leave a messages on answering machines using other leads? Well that won't happen with our live leads. We specialize in quality leads for the mortgage industry. Our reps are trained in a variety of mortgage calls including A,B/C paper, 125's, VA/FHA Streamline, and renter lists. Contact me for our mortgage lead guarantee. Introducing Live Transfer; phone screened mortgage leads who have requested to speak to a loan officer at that very moment! When you get a call from Alansis, you'll immediately know that you have an interested borrower just waiting to speak to you about their refinancing needs. Eleadspot is the leader in the origination and attraction of unique prospective borrowers who get Exclusively Referred and Live Call Transferred directly to your Loan Officers. Our exclusive leads dramatically increase the closing and conversion ratios for our clients. Most lead companies churn through customers and resell data repeatedly in order to make as much money as possible without regard to the client's needs. We understand the importance of getting exclusive leads and we also like to ensure our prospects that they will only be dealing with one representative, helping to prevent multiple phone calls by various vendors. LeadBull.com provides Nationwide Mortgage Leads for Mortgage Brokers and Loan Officers looking to gain the edge needed to succeed in the Mortgage Industry. We provide Refinance Mortgage Leads, Purchase Mortgage Leads, New Leadbull.com Verified and Live Transfer Mortgage Leads! Our New Verified and Live Transfer Mortgage Leads provide a higher quality lead that has been phone verified for accuracy. These leads are emailed to you instantly - No Cherry Pick System - You must pre-order to receive these leads that are custom verified based off your filters. Mortgage Lead quality is a hot topic in the Mortgage Industry. Leadbull.com's Quality Department pre-screens leads and researches bogus leads to assure our system is based on 3 principles; Quality, Fair Commerce, Superior Customer Service! Real time mortgage leads are sent to you in real time. The moment we receive the lead it is routed to your email automatically for action on your part. To begin receiving real time mortgage leads, simply setup a free account, enter the type(s) of leads you wish to receive, you also have the option of filtering your leads by state, loan amount, loan-to-value, credit rating, and including or excluding mobile homes. Once you set up your real time account and lead criteria, your fresh leads will arrive in your email effortlessly. LeadsForMortgage is a leader in Mortgage Lead Generation in the US. Our Lead Generation Process is very scientific and has been developed to customize the lead flow as per your requirements. Be it lead generation, Appointment Setting, Taking Details, Analyzing the Mortgage Details, Counseling, and forwarding the same to you, we do it efficiently and cost-effectively. You can get leads generated easily and cost-effectively by outsourcing it to experienced and quality lead generation experts like us who use state-of-the-art technology. The term �Live call transfers� has just recently gained a tremendous amount of popularity in the mortgage industry. At livecalltransfer.com we are at the forefront of the industry shift to this amazing marketing system. We are pioneers of the most powerful and innovative mortgage lead product on the market today. Imagine this. A Potential Borrower sees one of our mortgage advertisements and calls our 800 number. Our Inhouse Call Center greets the caller and takes their basic information. The interested caller is then transferred to you or one of your loan officers right away. Since 1998, we have been providing mortgage companies with quality real-time mortgage leads. Competing with the growing number of new mortgage lead providers, we are doing our best to keep our price per lead as low as possible. Building a Mortgage Company Is Serious Business! If you're spending your time looking for leads instead of processing and closing loans, its time to call the mortgage lead specialist, ProCall,Inc. You may have tried telemarketing in-house. All those long hours spent interviewing, training and supervising your own staff; it's a business unto itself. After achieving only marginal results, you found telemarketing was not only costly but difficult to manage as well. That's why telemarketing should be left in the hands of experts that truly understand the mortgage business. Whether you are a large or small lender QuickApply can help you expand your market share by sending you filtered loan consumers. You can narrow these consumers down to an area code within your state. QuickApply's niche is in contextual and search based internet advertising programs. Which means these consumers are searching for loan programs on their own. We have been providing exclusive mortgage leads, refinance leads, home equity loan leads, and debt consolidation loan leads since 2000. Many of our clients have been with us since the inception of our company. We believe in long-term business relationships and our goal is to help you grow your mortgage business with our marketing services. The Mortgage Traffic Company is a highly effective live mortgage lead generation provider. By combining state-of-the art technology with seasoned experts in the mortgage lead generation industry, we have created a system capable of generating as many high quality live mortgage loan leads as your company can handle. The Mortgage Traffic Company specializes in making your phone ring with Live Qualified Borrowers ready to speak with your Loan Officers. Database Systems Corp. provides mortgage marketing application software and loan tracking applications for mortgage lead tracking. This mortgage marketing application is completely integrated with our phone systems which can perform both inbound and outbound mortgage marketing campaigns. Our mortgage marketing software was developed using TELEMATION, our award winning contact management software application toolkit. This CRM software tool is ideally suited for processing mortgage loans and managing customer information. This mortgage CRM application is employed in a wide variety of organizations including contact centers, help desks, customer service centers, service bureaus, reservation centers and corporate call centers. Contact DSC to learn more about our mortgage marketing software and mortgage loan calculators.